Looking for Pagan Supplies? Shop Local! It’s “Small Business Saturday,” so I went to one of my favorite villages to support the local shops as I prepare for Winter Solstice giving. Supporting local businesses is so important when it comes to living more sustainably. Making such efforts is important to me on my path. If you’re going to spend money on material goods, why not keep it in your local economies and help regional artisans, farmers, herbalists, etc? If at all possible, help talented local Pagans! As I browsed, I thought about the many times new Pagans ask where one can get “supplies.” Usually, they’re looking for metaphysical shops. Yes, they can be great places to start, but what if they’re gone? Many communities have lost brick and mortar Pagan shops due to the poor economy. Even if you’re lucky enough to have one or two, they may not be in convenient locations. Or perhaps they carry some items but not others, or they just aren’t up to your ethical standards. We all know the places I’m talking about: mass produced statues made in China, cheap incense that makes you gag, paraffin candles, gem stones of dubious origin that were probably raped from the Earth Mother… Get the picture? So what’s a tree-hugging dirt worshiper to do? My suggestion is always to look at three categories of local shops: artisan co-ops, heath food stores, and local food producers. Let’s take a look at each category. These are places in which artisans from around the region each pay an entrance fee and cooperatively work together to sell their goods in one location. There are usually a variety of mediums represented. There are a few in the Northern NY region around the 1000 Islands area, and I know they exist in other places. They’re often the most impressive shops in otherwise touristy areas. (Who really needs another plastic snow globe?) What would interest a visiting Pagan? The shop I was in earlier had a plethora of hand dipped candles (including black, believe it or not), wooden and clay bowls, incense holders, blended oils, soaps (think purification), tea, and my favorite handmade incense. Heck, you could even buy a woven or dyed scarf and use it as an altar cloth if you want! Don’t see exactly what you want? Chances are, there’s an artist there who could make it for a commission. Sure, things are a little more costly, but walking an Earth-Centered path means making more ethical choices. Saving up for a handmade wooden bowl may cost me more, but there’s more integrity there than buying a cheaper, mass-produced bowl in a big box store. Think of the act of saving and supporting an artist as an offering to the Earth Mother! The beauty of co-ops is that you get to meet the different artists, so I’ve had the opportunity to talk to many of the people. I know that the woman who makes the incense, for example, doesn’t use some of the harmful ingredients that other brands use, like saltpeter. She also grows or forages for many of the ingredients. Does your hometown have a small health food store? Try to support them when you have herbal needs! Many sell organic herbs in bulk. I can get just about everything I could want at my local shop – dry herbs, essential oils, carrier oils, and, occasionally, beeswax. Some even carry clean-burning candles and incense. If I can’t grow it or forage for it myself, chances are my local health food store will have it. If not, they can often order it for me. If you’re advancing in your studies and want to make your own herbal goodies, or you simply want specific herbs for an offering, start here! I’m referring to farm stands, wineries, and distilleries here. Eating local is a large part of my Druidism because it forces me to pay attention to the agricultural year, hence the Wheel of the Year. Locally grown food or flowers could be in your calming tea, your healing pot of soup, your group potluck, or your offering bowl. Interested in making herbal goodies in your magical rites? Get your hands on some local honey! That stuff is already brimming with healing energy. Similarly, your wineries and distilleries will offer different alcohols in which to infuse herbs. Unless you’re specifically looking for some energy from another land, alcohol made with grapes, grain and other ingredients from your region will be flowing with the blessings of your local Nature Spirits. The next time you meet a new Pagan who wonders where to get supplies, I hope you’ll refer the seeker to an artisan co-op, health food store, or local food producers. The old shrine. Photo by Grey Catsidhe, 2015. Sometimes we have to take a pilgrimage to where it all began – to the source of our spirituality. By that, I mean the places where we first felt the stirrings of spirits around us, observed the interconnection of everything, and where our soul first learned to dance. For me, that place is my childhood home – in particular, the forest behind the house. I grew up able to play in the shade of white pines, sugar maples, red maples, black cherries, crab apples, and aspens. I learned the name of many plants, native and invasive, and whether or not I could eat them. I learned how to recognize numerous birds by shape and call. I often woke up to find herds of deer or flocks of turkeys outside my bedroom window. Once I even saw a pine marten. I meditated below those trees, poured my first offerings there, and hailed the moon on that land. On summer nights, the song of crickets and spring peepers was my lullaby. On winter mornings, the happy coo of mourning doves was a gentle alarm clock. Although I was baptized a Roman Catholic, I always felt the most spiritual out in the forest. As moved into Paganism, and as that grew into Druidism, I started to visit a particular spot often. 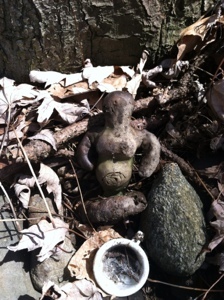 I made an Earth Mother statue, placed a small, porcelain teacup below her, and brought her interesting stones, seeds, flowers, etc. The shrine is still there, although I have to gently remove the pile of leaves blanketing it each visit. I always feel a mixture of gratitude for where I’ve been and an extreme nostalgia for the childhood that is gone. I can almost imagine the ghost of my childhood self playing around the trees. Perhaps that is a different type of Nature Spirit or ghost – the positive energy we left behind in our old haunts? I wonder what will become of my old shrine should my family ever move. Should I take those relics with me, or should I leave them there for a new child to wonder at? Who knows if I’ll ever have to cross that bridge. It makes me a little sad to think of all the childhood homes that are now inaccessible to others because they moved away. Such is life, though. We can always return in our minds if we quiet ourselves long enough and unlock the memories. For now, the shrine remains, a special landmark I occasionally pilgrimage to. Dandelion Cookie Offering. Photo by Grey Catsidhe, 2015. I seem to post about food an awful lot, and I hope you’ll forgive me. Harvesting, making, and preserving food plays such an important role in our religious traditions and holidays. 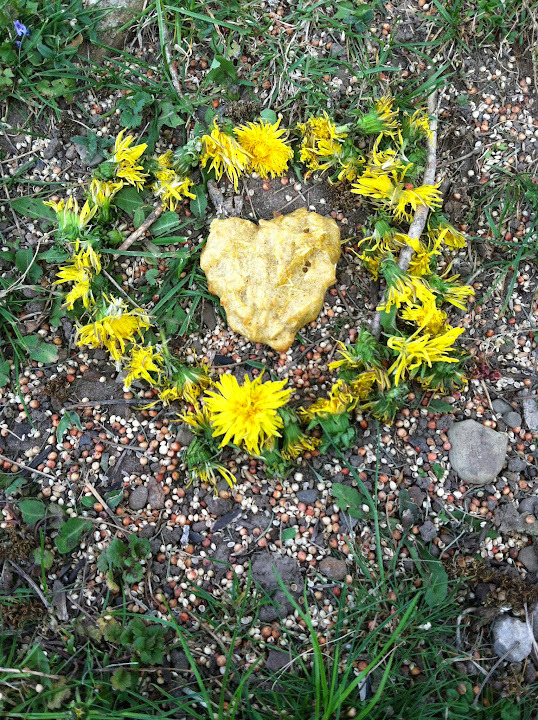 I recently recognized what has become a family tradition in early May – harvesting and cooking with dandelion flowers. In fact, I know we had a huge harvest of dandelions around Mother’s Day last year because I have an adorable photo of Bee, dressed up for the day, sitting in our backyard surrounded by lovely yellow dandelions! It was around that time that we made dandelion cookies. On Saturday, after treating myself to a fabulous hot stone massage, we returned home, then Bee and I gathered some dandelion flowers. Day by day, I’m teaching her to respect nature, how Mama Earth provides food for us, how we work with other creatures like the honeybees, and how to express our gratitude. Seeing her grow in her knowledge and vocabulary is just magical. When the cookies were done baking, I saw that one looked like a heart. Immediately, I knew I wanted to give that one back as an offering to the Earth Mother. Bee picked a few too many flowers, so we gave those back as well. 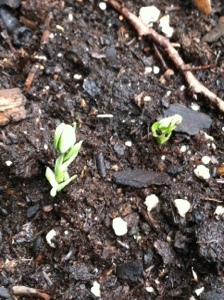 Between the birds, the ants, and the rain we had last night, the cookie is indeed going back into the Earth Mother. Land, Sky, and Sea. Photo by Grey Catsidhe, 2015. I’ve had such a lovely Mother’s Day today. We had breakfast in my favorite cafe in Clayton, NY, then spent some time at Grass Point State Park. We put our feet in the river for the first time this year, and it felt amazing. It was like a homecoming. While Bee and her father played on the slides, I sat under some willows, where the land met the river, and meditated for a little bit. 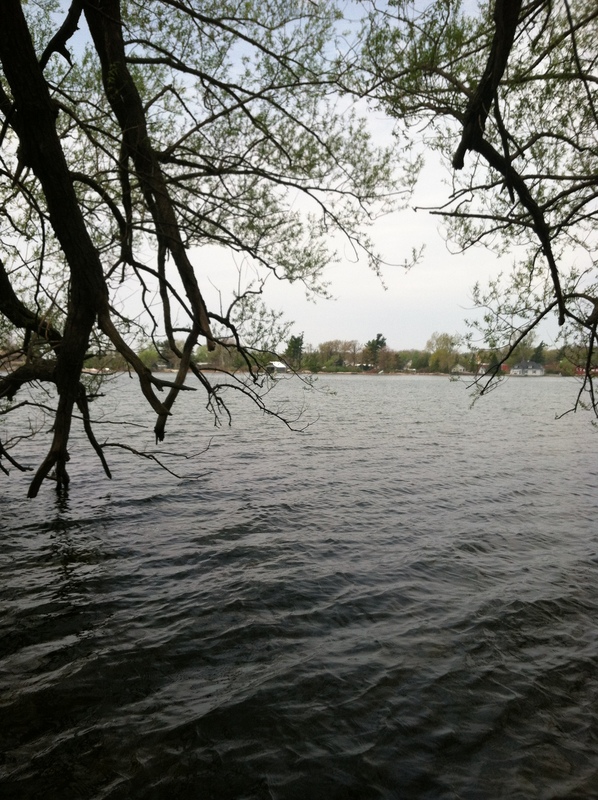 I watched the honeybees pollinating the flowers all around me, watched the terns swoop through the air, listened to the St. Lawrence River whisper against the sand. Nearby, plants grew, an otter carcass decayed, and seabirds sang over the small, rocky islands. Everything, everyone, was part of the Earth Mother, and I was there with them. Just as she nourishes me, I nourish my daughter. One day, we will nourish others in the great cycle… I sang to the River Spirit who is part of the Earth Mother.